One Agency (BlueWinston account) can have multiple AdWords account connected. Social network links in notification emails. Bigger bad words (up to 80 chars). Added wrong character to keywords validator. Allow all SSL protocols when downloading xml file. Allow only Tls12 SSL protocol when downloading xml file. Banner in left side panel changed. Fixed product name truncation algorithm. Added maximum limit 900 for default max cpa. Added banner to left side panel. Preview URL template in Product-Group campaigns. XML format errors are shown in UI. No active subscription update is mark as Warning (not Error). Fixed Campaign negative keywords length limit. Fixed Synchronization of campaign status between Adwords and Bluewinston. Validate keywords created from scripts. Fixed Localization of js select2 component. Added tutorials in left menu. Fixed Enable campaigns when product paid. “Remove everything before this text from Product name” and “Remove everything after this text from Product name” in ads creation ignore diacritics. Left panel position is stored in cookie. Updated URL modificator for Product-Group campaigns. Empty Path1 in Expanded Ads editor is allowed. Fixed Duplicates in keyword creation by combination. Fixed Excluding Search Term keywords with wrong word count. Now are skipped. XML filters “Forbidden words” and “Words mut be” ignore diacritics now. Fixed Preview ads count calculation. Fixed Campains are not activated when payment is received. Fixed Slow campaign list loading in admin ui. Average price is used in bid management when Product-Group campaign is used. New tag “Price from” in ads editor when Product-Group campaign is used. 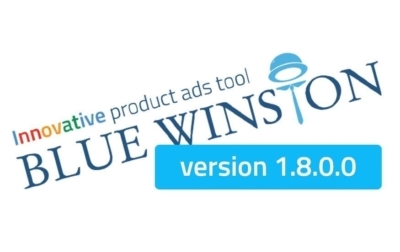 Show prices in Product-Group campaign in preview blue box. Added “Truncated product name without previous used parameters in URL” option in Product-Group campaign base url editor. Removed “Truncated product name without manufacturer”. Check google account for Adwords account during registration. Changed some UI text for Product-Group campaigns. Show more campaigns in list. Search whole XML for tags in Tag assignment page. Fixed preview of expanded ads count. Fixed Product word counts when disabled. Added Download button in Preview box for excluded products. Fixed Ads creating when wrong price tag is in XML. Fixed Too short interval between AI calculation notification. Fixed Update cycling when Adwords API returns error. Check real xml file size during download. Added info when wrong xml file size. Script calculator added into Admin menu. Fixed Unable to create grouped products when empty tag is used in XML. Fixed Small bugs in Scripts. Empty elements are parsed in XML. Fixed BBM script (AI) checks base AI variables too soon. Fixed Low data in AI initialization. Fixed Wrong price parsing on product filters page. Fixed Wrong price tag preview in expanded ads. Fixed Path1 in expanded ads contains non alpha-numeric characters. Fixed Removed . character in displayUrl for standard text ad. Fixed Remove . char from pat1 and path2 fields in expanded ads. Fixed Find ad id after api call. Fixed wrong characters in Expanded Ads in Path1/Path2 fields. Fixed Texts in Ads are now without wrong “_” suffixes and prefixes. Fixed Bad words are now correctly removed.. Fixed expanded ads preview and xml export. Added additional VAT info in product ordering. Added tag preview in keyword truncation page. Fixed format in final XML in Preview. Added customer list export for newsletters. Added extended logging for AdWords reports. Fixed Campaign total statistics calculation fixed. Fixed Script report performance optimized. Fixed Calculation of last 90 days. Fixed Load summary keyword reports during script calculation. Fixed xml product names with zero-width spaces. Customers campaigns with no active subscription are paused. Fixed “Reset Keywords MaxCPC to ADGROUP” feature.